We stumbled upon Lychee Liqueur yesterday and just had to find something to use it in. A few years back we planted a lychee tree and this year it finally bore fruit. We yeilded 15 lychee nuts. Currently we are infusing rum with it and have yet to try it. Now, I admit I broke a cardinal rule here using the little yellow lemon juice bottle, but we were in a pinch because there was not a fresh lemon to be found in the house. Thats why we keep a few of these babies in stock. Thankfully the recipe only calls for a dash. 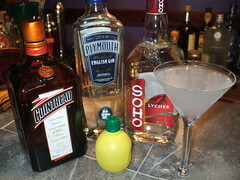 It was a tasty drink with the unique lychee flavor and the kick from the gin made it feel like a masculine drink. The recipe book I found it in states this should be made when the orange blossoms are in bloom, but that doesnt happen until March in Florida, so a brisk (65 F)November evening was just fine with us.